The Seattle Cascades are a professional ultimate team that competes in the West Division of the American Ultimate Disc League. The Seattle Cascades are a professional ultimate team that competes in the West Division of the American Ultimate Disc League. The season runs April-July. As we work to build an outstanding ultimate program, we carry with us a set of core values: integrity, community, and athletic excellence. The name "Seattle Cascades" refers to the Cascade Mountain Range which runs through Washington State. The 2014 "Seattle Raptors" name will be retired. We look forward to seeing you on the field, cheering with you in the stands, and building an excellent organization that will contribute to the growth of ultimate. Ultimate is a fast-paced non-contact sport, played 7v7 on a football-sized field. Ultimate incorporates amazing throws, big plays, the field movement of soccer, and the pace of basketball to create a fan-friendly sport. The official game rules of the AUDL can be downloaded here. The American Ultimate Disc League is the first and largest ultimate league in the world. 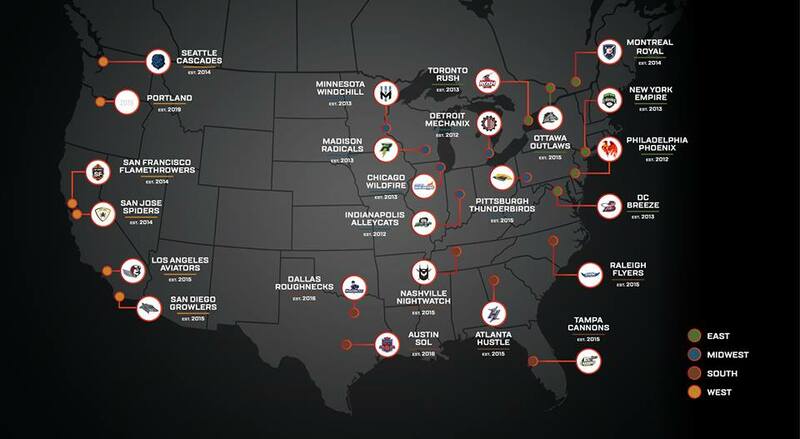 The league's mission is to increase the visibility of one of North America's fastest growing sports by creating fun, family friendly events that showcase the sport being played at its highest level. The American Ultimate Disc League consists of four divisions. When do the Seattle Cascades play? Our regular season runs from April to July. The post-season consists of one or two West Division playoff games followed by Championship Weekend, where the top team from each division plays for the AUDL title. Who will the Seattle Cascades play against? The Seattle Cascades are in the Western Division of the AUDL. We match up against Los Angeles, San Francisco, San Diego, and San Jose. Vancouver was part of the West Division through 2017, and Portland will be joining in 2019. Follow the links at the base of our website for more information about our opponents. The West Division Playoffs occur a couple weeks after our last regular season game. Depending on the standings, the Cascades play one or two playoff games with the goal of advancing to Championship Weekend. What does the winner of the championship get? The AUDL Champions receive a $25,000 player prize, along with ULTIMATE bragging rights! Absolutely! Seattle is home to a couple of the best women's teams in the Country, Seattle Riot and Seattle Underground. Seattle's mixed-gender teams compete with women and men on the field, and include Seattle MixTape (reigning national champions! ), BFG, and many others. The Cascades Cup is a staple of our home game schedule, and will feature women and men on the field in front of our Cascades fans. Recently, one of the owners of the Seattle Cascades, Qxhna Titcomb, created a team of female college All-Stars that traveled around the States and played the top club teams. All of the games were streamed live and free and charge, and can be watched here. Is there a professional league for women? Unfortunately, there is not currently a professional ultimate league featuring women. Steps are being made to promote the involvement of women in ultimate. The Cascades are interested in playing a meaningful role in this movement. The challenges are real, and we are focused on making progress that is both tangible and sustainable. We are optimistic that we will at least move the needle on Gender Equity for this generation of athletes.